The reason for composing this masterpiece was primarily the death of Alessandro Manzoni in 1873, Verdi's most revered Italian writer. With this Requiem, Verdi wanted to erect a memorial in Manzoni's honour. By April 1874, Verdi finished the Requiem in 1874. The performance in the church of San Marco in Milan was an incredible success. Three days after the peformance a second performance was conducted by Verdi at La Scala (!). Franco Faccio conducted a further two. Is Verdi's Messa Da Requiem sacred music ? The answer may be yes, because there is a liturgical text set to music. Verdi's intention was to express the emotional meaning and implications of the liturgical text. 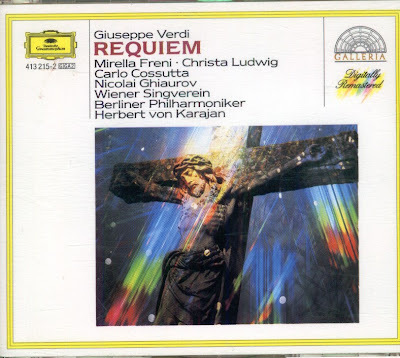 The Requiem unquestionably conveys operatic elements. But nevertheless the Requiem can be performed either in church or theatre. The Copact Disc (2 CD) was released by Deutsche Grammophon, year of production1972, purchase in 1991, Digitally Remastered, (ADD). Deutsche Grammophon 413215-2 (G/GA2).